Can I let you in on a secret? You have to promise not to tell anyone who has been eating at my house lately. Promise? Ok then. My family has switched over to Almond Milk. It's true. We even went so far as to buy the 3 pack from Costco. Yeah, we're committed. I have found it to be an excellent substitute to everything. Well, almost everything. Nothing beats Oreo cookies and a class of good ol' fashioned milk. I started slowly, adding it to my cereal, adding it to my oatmeal, and using it in recipes that called for dairy-free milk. This week I took the plunge. I used it in ever recipe that needed milk. Then I did the unthinkable. I used it in my tried and true muffin recipe. It was so amazing, the next time I made them, I substituted half of the all-purpose flour with whole wheat flour. I originally got this recipe from my Mother-In-Law, who is, by the way, a FANTASTIC cook. Her blueberry muffins are my favorite. At least, they were until I updated her recipe a bit. I still beat the egg a little before I add the rest of the wet ingredients. I still leave a well in the dry ingredients and pour the wet ones in. This is the point that the recipe could go a number of ways. You could add bananas and pecans, you could add jam, you could just cook them as is. This dough stands alone. But I make a few changes. I use almond milk instead of regular milk (and I used a larger amount), I use wheat flour instead of all-purpose, and which berry do I use? If it's just Hubby and I eating, I usually fill the muffin tin 2/3 the way up and then bake these bad boys. But when, like now, someone is staying with us (Hubby's 16 year old brother), then I like to add a little sweetness to the top. And a little sweetness goes a long way. I'll add all the variations at the end of this recipe. But my favorite is the berries and the brown sugar. So simple and so satisfying. Combine the dry ingredients in a large bowl. Make a well in the center of the mixture. In a separate bowl slightly beat the egg and then add almond milk and oil. Pour liquid mixture into dry ingredients, stirring just until moistened. Spoon into greased muffin pans, filling two thirds full. Bake for 20-25 minutes. Remove muffins from pans immediately. Yield 10 muffins. 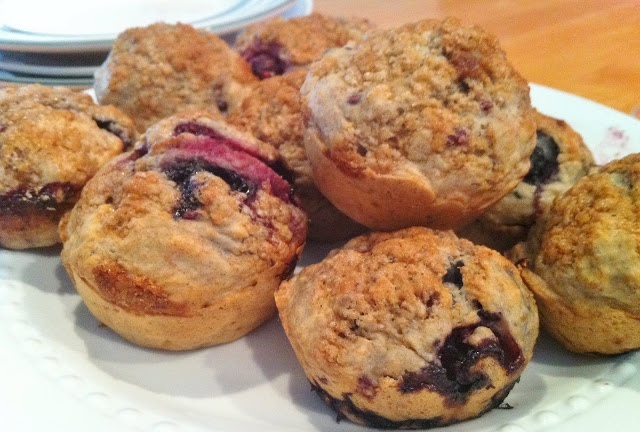 Berry Muffins: Fold 1 C fresh or frozen berries washed and drained into muffin batter before baking. Jam Muffins: Fill muffin pans one third full, top with 1/2 tsp jam or preserves, and spoon remaining batter on top. I made the switch to almond milk about a year ago, we love it. Sounds yummy! And by the way, Oreos are just as good with Almond milk. It makes them soft but less crumbly! Yum! That looks delicious! My son drinks almond milk and I love finding recipes to use it. That looks yummy! My son drinks almond milk and I'm always looking for recipes to use it.